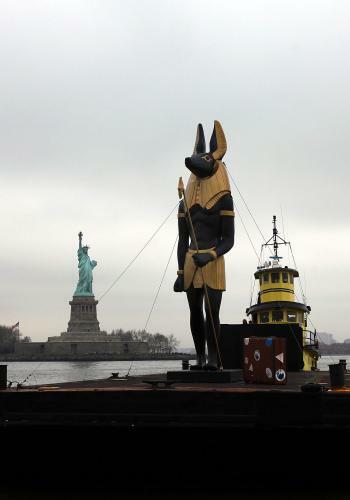 To celebrate the new King Tut exhibit that opens later this month in New York City, an enormous statue of Anubis was barged up the river and will eventually take its place in Times Square. I love these pics of Him beside our own Lady of Freedom. 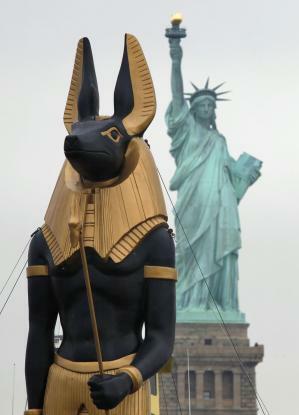 Some conspiracy theorists contend that Lady Liberty was based on—shock, shock—a Pagan model of…even more shocking…Isis! OMGoddess!